Add organizational structure: Insert headings to group your items into weeks or themes, based on your teaching approach. By grouping your Course Map items into manageable chunks, you will make it easier on students to stay on track. To insert a heading, click on the icon just below an item (far right). A field will appear. Enter your heading. You may reorder the position of a heading or delete it (see icons for these functions to the far right of the heading). Adjust the order of your items: By default, Course Map lists items from modules, discussions, and AT&S by open date. The Syllabus is always listed first, and items with no dates are listed at the bottom. 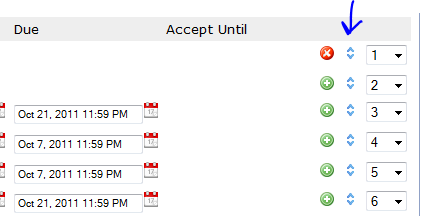 You may need to order items in Course Map by a sequence other than open dates. To adjust the position of items on your Map, use the numeric drop-down menus to the right of each row or drag-and-drop. a) The numeric option is best if you need to move one item from a position to another specific position. Change the number of an item to where you want it to be positioned. The screen will refresh and the item will be moved and saved to the new position. b) For ordering multiple items, the drag-and-drop ordering functionality is much more efficient. An icon with an up / down arrow to the far right of CM is used to indicate drag-and-drop support. Please note that you can ‘grab’ a row anywhere to reposition it; the icon is just in place to indicate that drag-and-drop support is available. Hold down a row with your mouse and drag it to a new position. Release the mouse. Save. You must click on “Save” after you are done reordering items (or other CM functions). This allows you to order multiple items and save them all at once. Once drag-and-drop is used though, the numeric ordering option is hidden, since the numbers would be out of order. Upon clicking on “Save,” you have both ordering options back on your CM. Adjust your dates: Course Map makes it easier to spot discrepancies in the dates of your course items, as it allows you to view your dates in one page. You can change your dates in Course Map and click on Save to preserve your changes. Once an item is in Course Map, changes to dates will not change its position. The only way to change the order of items in Course Map, once CM has picked up the item, is to change the order in the map. When an item has a new date, Course Map flags it for you. You can re-order it and click on Accept Positions. Set prerequisites: Course Map allows you to set items on the map to be ‘blockers’ – meaning that students cannot access anything below a blocker item until it is completed. Any item on the Course Map can be set to a blocker (i.e. syllabus, modules, discussions, tests, assignments and surveys). The only exception is discussions that don’t have a minimum post requirement, as CM can’t mark these items as complete unless you have set minimum criteria. To set an item as a blocker, check the box on the left of its title. In the below example, the Syllabus is a blocker. In the above example, students will not be able to access the module, discussion or quiz 1 unless they accept the syllabus. Once you have set blockers in Course Map, your course site is ‘aware’ of them. If students try to take Quiz 1 from AT&S, in the above example, they will see a “Prerequisite” link with what they must do first. In Course Map, the rest of the items will not be hot link until the Syllabus is accepted. Ideally, blockers should be set up with generous time-frames so that students can move through the learning sequence at their own pace (within your boundaries), as they finish the required prerequisites. If students don’t complete a prerequisite by the deadline, and it closes on them, they can’t move forward to subsequent items. They will be stuck. 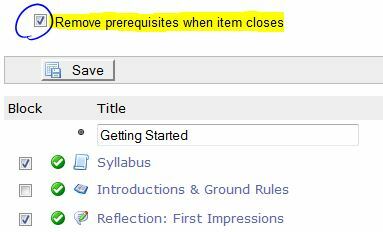 You can use the special access feature to give extensions to students who missed a prerequisite. Better yet, you can set Course Map to remove the prerequisites automatically when blocker items close (see screen shot below for the location of this setting). This function allows you to use the blocker feature to pace and guide students with regard to the order that they should complete tasks, but without closing their access to future items, should they miss one or more deadlines. If invalid or unpublished items are blockers, the blocking will be ignored by CM. Items must be available to students to take hold. Set mastery level: At the top of the Course Map page, you can set your mastery level (i.e. 80%). The mastery level feature works with assessments that are set to ‘unlimited‘ tries. This is ideal for practice skills tests. It allows students to keep taking the test until they reach the master level. If an assessment is a blocker and is set to ‘unlimited’ tries, students will not be able to proceed until they reach your mastery level. If the assessment is set to unlimited tries, but it is not a ‘blocker’, students will be able to move on without having met the mastery level, but Course Map will inform them visually that they haven’t met it (yellow alert). 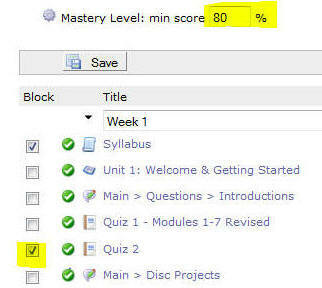 To set the mastery learning level, add the percentage that you desire and click on ‘Save’. This value will be applied to all assessments that are set to unlimited tries. You can change the mastery level value at any time. It’ll be effective immediately. In the below example, Quiz 2 is set as a blocker. It is also set to ‘unlimited tries.’ Students will not be able to gain access to anything below Quiz 2, until they complete it with a score of 80% or better. If students don’t earn the mastery level points required to move on, they will be informed by Course Map (alert icon by the quiz title).